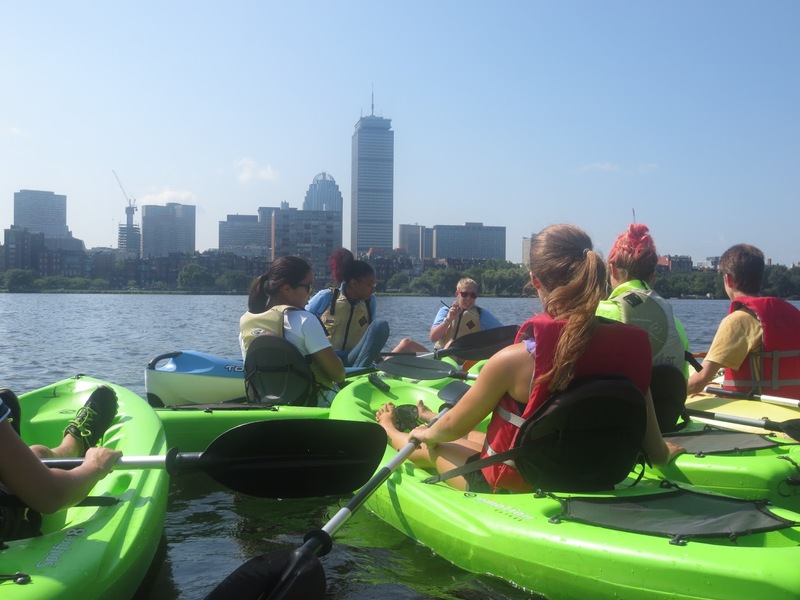 Wednesday at Community Boating we had the highest number of kids this summer, and with the beautiful weather we thought it would be a great idea to explore Boston from kayaks. 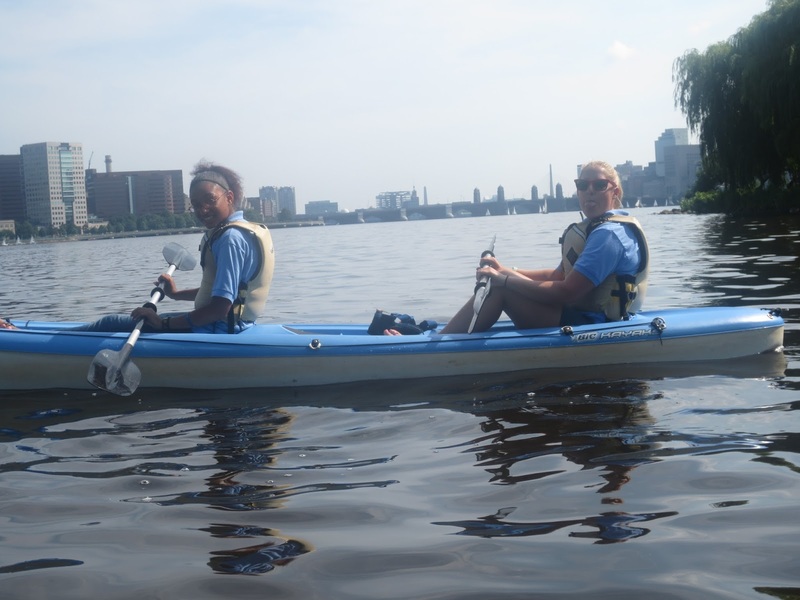 Kiauna was a little apprehensive about getting in a small self propelled vessel so I stepped up to the plate and decided as a Senior Marine Educator it was my duty to help her conquer this fear. So into the double kayak we went, and I don't think Kiauna had a clue as to what she was getting herself into. 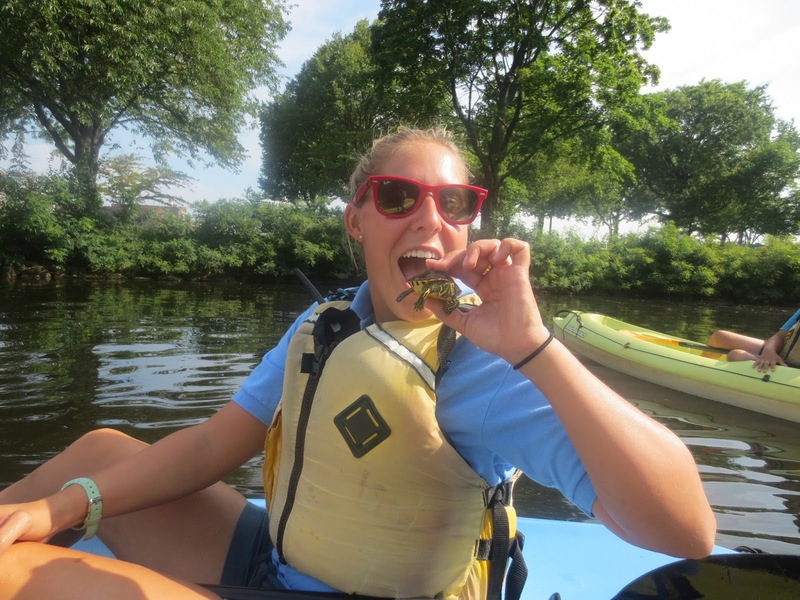 As we paddled along the bank of the Charles I thought it would be a great talking point for the kids if we caught a sun-bathing painted turtle and talked about the differences between the fresh and salt water reptiles. 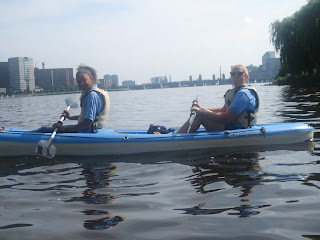 I told Kiauna the game plan: I stealthy paddle near a turtle, while she gently grabs it around the roundest part of the shell and put it in the Yak. Now this is a pretty good game plan unless the person that is suppose to catch the turtle has an innate fear of turtles. To my surprise Kiauna was able to push her fears of kayaking and turtles aside and capture the wily reptile that guards to shores of the Charles. After the great capture we wrangled all of the kayaking kids to the center of the Charles where we talked about the painted turtle and different types of flora and fauna that can be found in the Charles. 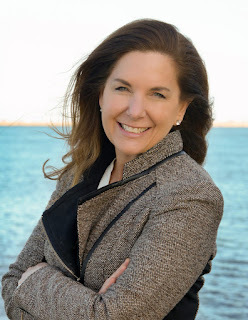 The kids were especially interested to learn about the American Eel and its ability to live in the fresh water of the Charles, travel to the salty Ocean to breed, and then subsequently die after procreating. This makes the eel catadromous, a species that travels from fresh to salt water over the course of its life, and it also makes it a terminal breeder, an organism that dies after it lays or fertilizes their eggs.